Address: 1111 Budapest, Gellért ter 1. The hotel has 234 rooms. 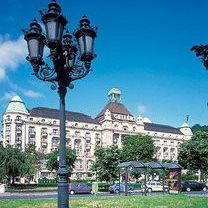 Hotel Gellert **** is one of the most traditional Hotels in Budapest and Hungary. Cultivated guests who admire traditional architecture and dedicated service will honour this preserved jewel of construction art and in the same time enjoy the unique historical atmosphere. The Hotel was erected on the right bank of the river Danube between 1916 and 1918 until opening to the public on September 24th 1918 and has maintained the highest recognition ever since. The special ambience and furniture of the rooms together with the friendly style of the hotel are blending in perfect harmony. Danubius Hotel Gellért located in picturesque environment at the foot of the Gellért Hill, on the bank of the Danube is ideally situated for both business and leisure travellers. This impressive location is within walking distance to Budapest's most fashionable shopping and business district with one of the most beautiful sights of Budapest, the Liberty Bridge.